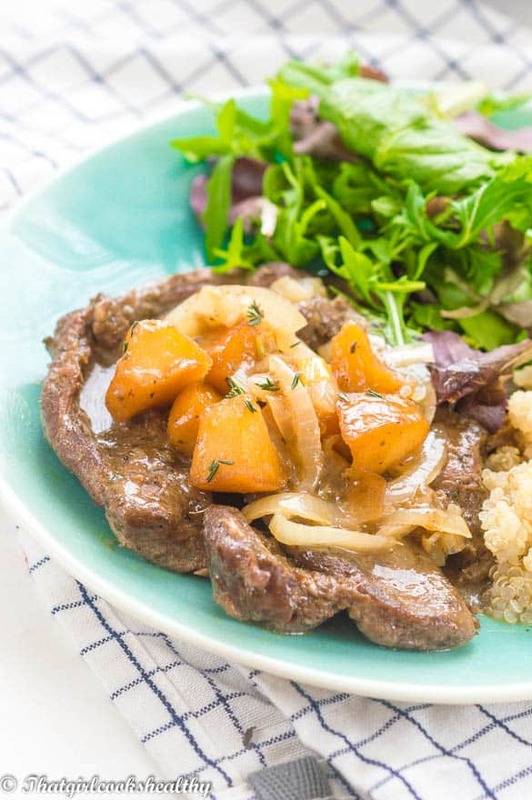 Lamb leg steaks recipe – succulent cuts of the lamb’s leg, marinated, pan seared and cooked until tender then topped with caramelised apples. Another main meal recipe that I’m adding to the blog. 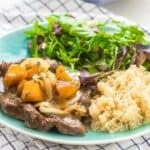 This one features lamb leg steaks with caramelised onions a recipe which is currently on rotation in my house. I always do lots of trial and error with my recipes, especially the meat based one. Sometimes a recipe can taste perfect the first few times. Then Charla will try to change things up a bit, with the results varying. 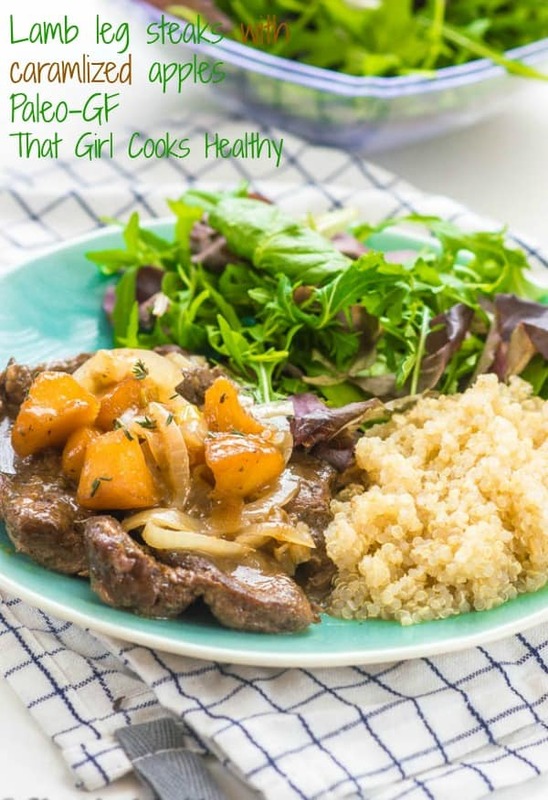 I’m a huge fan of slow cooker lamb leg steaks, that and shanks are my favourite cuts of meat. However, I don’t cook it very often as the Island in me has a tendency to cook mutton or goat. Both of which aren’t really very popular in the UK but very commonplace amongst many Caribbean Islands. Although this lamb leg steaks recipe is not exclusively Caribbean, there a few elements which have some common ground with the Islands. The meat is generously seasoned thanks to my homemade marinade and the steaks are well done. 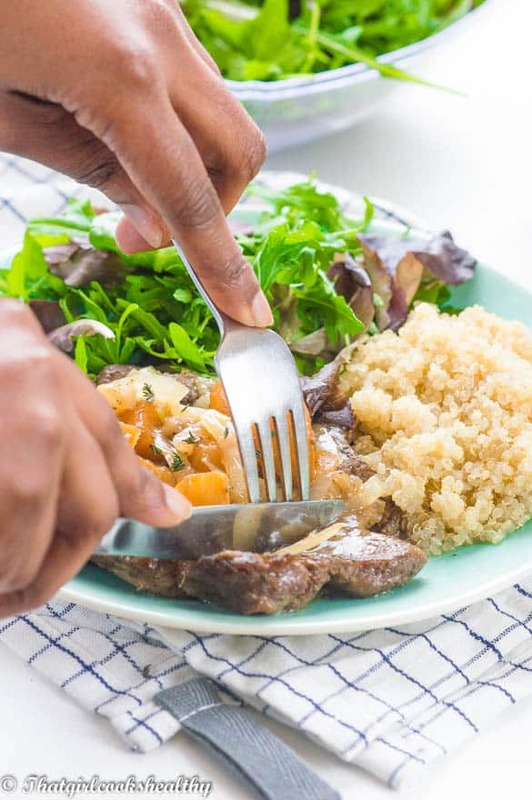 Generally as a rule of thumb for Caribbean cooking, you won’t really find cuisines that feature red meat – rare, blue or medium rare. We like our meat well done and heavy albeit not overpowering with the seasoning. Also meat is typically left to marinate overnight. Followed by what preparation is needed the next day. In respect to this lamb recipe I actually by passed the overnight marinating method. Instead, I applied the wet rub and let the meat sit for 1-2 hours. The reason being is because the steak I used was quite thin which allowed me to skip the depth of marinating the meat. Also, as the meat is well done and pan seared the flavour really locks in. Lamb steaks are the most lean cuts of meat which is a bonus. There’s not much fat to trim off and the price compared to its counterpart – the shank is affordable too. When purchasing lamb, as a quick tip, you want cuts that are rosy pink or red in colour. This signifies it’s freshness, meat that is a deep dark red is more than likely old. Old meat will be tough as boots and not very tender when cooked which is not want we want. 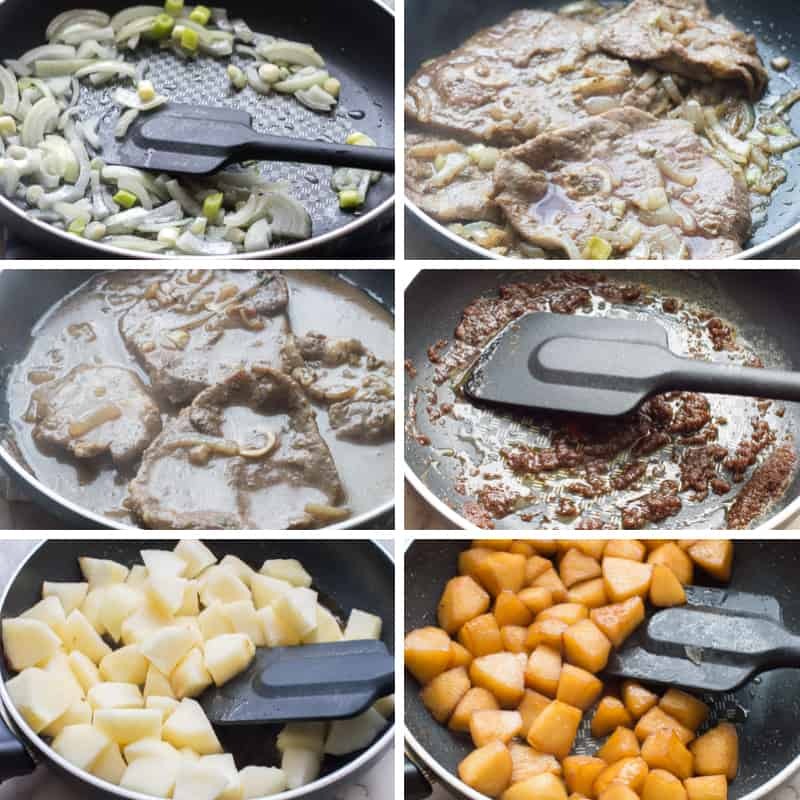 The marinade – the first thing I would recommend is to prepare the marinade. Do this first and foremost to the meat and infused the flavours while you carry out other recipe related tasks. If you have a spice blender with a wet blade/pestle and mortar or food process all of the aforementioned will do. Searing the meat – very very importantly part of the cooking process to lock in to flavour a couple of minutes per side. Prepare the apples for caramelization – Create a syrup with the coconut sugar so the apple can evenly caramelize. 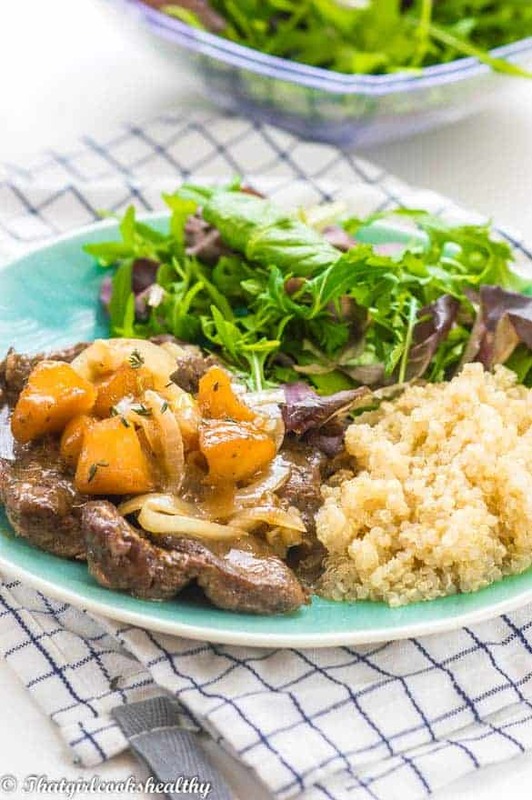 The caramelised apples really enhance the flavour of the meat. A combination of sweet and savoury which creates a food heaven in your mouth. Can I cook this recipe in the oven or slow cooker. Yes you can, following the same principle up until searing the meat. For a slow cooker – you would add your meat and water after braising and cook on high for 4 hours. In the oven – it should take 30 minutes in a deep roasting pan but cover the pan with some foil so the liquid doesn’t recede. The meat can be left to marinade overnight although it’s not required. Place the pink salt, garlic, ginger, bay leaf, sage, marjoram, coconut aminos and coconut oil in a coffee grinder or food processor. Pick the leave off 4 sprigs of thyme and add with the rest of the ingredients. Discard the stem and put the remaining 2 sprigs to the side. Pulse the ingredients into a wet rub. Scoop out and proceed to massage the rub into the steak so it is completely coated. Allow the meat to marinate overnight or 1-2 hours if your prefer to hasten the preparation. On medium heat, melt an additional 2 tbsp of coconut oil in a large frying pan or skillet. Scrap off the rub from the steak (Reserve the excess rub) and pan sear each side of the meat until a crust is formed. This should take 3-4 minutes per side. Once the meat is seared, stir in the tapioca starch into the 1 1/2 cup of warm water with the excess rub and pour it onto the pan. Increase the heat to high to a rolling boil before reducing to low. Add the additional sprigs of thyme to the pan, cover the pan and simmer for 20-25minutes. During this time the sauce til begin to thicken, check periodically to ensure the liquid doesn’t recede too quickly. You should be left with enough sauce to cover the meat with. As the meat simmers away, prepare the topping by peeling and cutting the apples into small cubes. If the apples are turning brown during this process then simply let the chopped apples sit in salt water (drain off afterwards). Once the apples are chopped, on low/medium heat, melt the dairy free butter in a small pan then add the coconut sugar to the pan and swirl in the butter to create a dark liquid sugar. Add the apple pieces to the pan and coat so each side is exposed to the liquid sugar. Continue to stir and turn the apple until they darken. Pour in the 2 tbsp of water then cover the pan and leave to steam for 5 minutes. Keep an eye on the pan so the apples don’t burn. Replenish with a splash of water if needed during this time. Thank you so much Albert. What a glorious sounding recipe, I think leg of lamb steaks are very much under rated, one of my favorite simple piece of meat to cook. They also work really well on a grill. Thanks Brian. I totally agree leg of lamb steaks are grossly underrated and my favourite cut of meat. I will try grilling them next time! So many great flavours! The marinade and caramelised apples are such a great touch. I agree and thank you Kate. Wow. 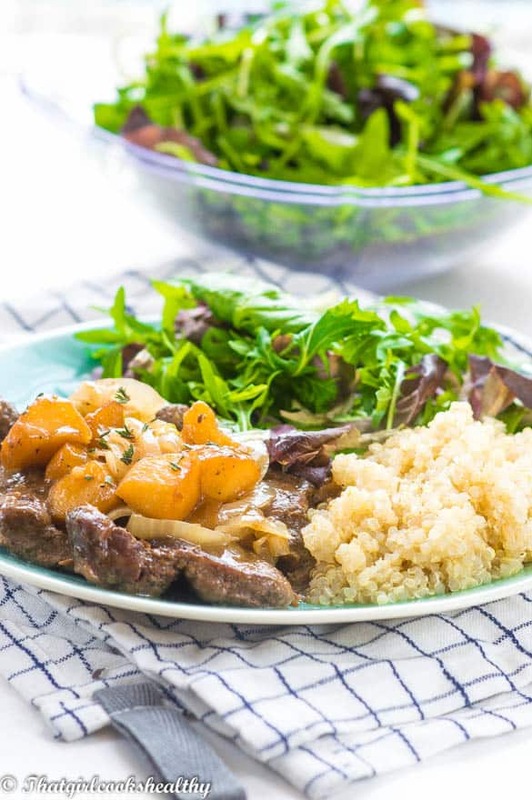 Loving the idea of caramelised apples with lamb steaks. It’s a new combination to me but it sounds so good. 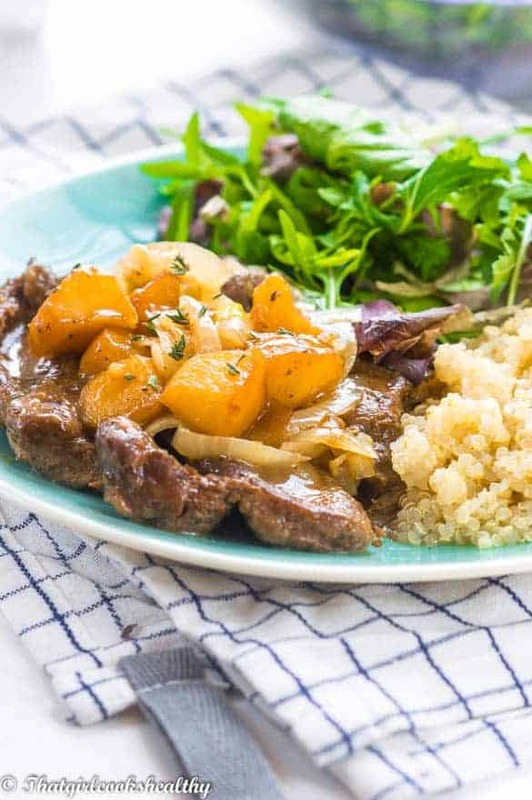 The caramelised apples on top of the lamb makes a HUGE difference in terms of taste. I don’t eat lamb but I bet this would turn out equally delicious with pork chops! Oh yes, definitely could pair the ingredients with pork. This can be a huge concept! Shepherd’s pie is loved by my spouse, but I am a buff, yet this variation I can easily get driving!